Reports on social media, which have been picked up by mainstream news outlets across the world, claim a UFO has been filmed seemingly rising into a “portal” that then closes and vanishes. However, despite reports of the visions continuing as recently as yesterday, experts have now dismissed it as a viral hoax which has been viewed well over one million times. One international news site ran the story yesterday. A still from the viral footage showing the “UFO entering the portal”. 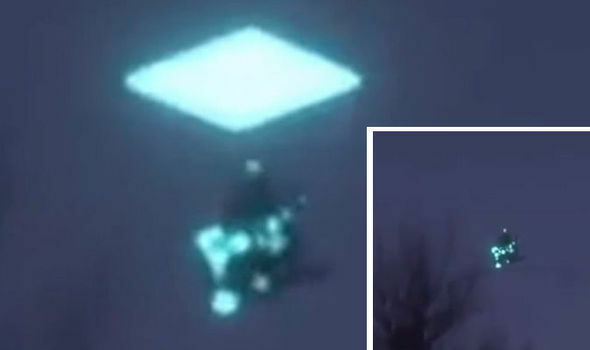 The article said: “The strange video, seeming to show a mysterious unidentified flying object full of lights in the night sky, has emerged in media circles in Yakutia, the largest region in Russia. “There is no information about when and where it happened. “Yakutia or the Sakha Republic is the largest region in Russia, and appropriately is famous for its diamonds. The story was then covered in the UK press. However, the new reports show how easily viral reports can travel online. Express.co.uk reported back in June how debunking website Snopes.com had reached the conclusion a video showing the same footage, which was viewed by more than one million people, was likely a CGI-made fake. The website examined a version of the same video doing the rounds on social media, which said the event had been filmed in southern Colorado. Snopes added the video did not even originate from Colorado, and was first reported in March this year as being Sonora, a Mexican state on the US bord.